Continuing a noble tradition, the Northwestern Alumni Association honored the 75th class of award-winning graduates — a distinctive group of achievers and leaders. In late March, the Northwestern Alumni Association added 21 new alumni to its list of distinguished award winners. They joined the likes of Charles Mayo (FSM1888), co-founder of the Mayo Clinic, Kenesaw Mountain Landis (L1891), the first commissioner of baseball, and Walter Dill Scott (WCAS1895), the first alumnus to serve as president of the University. At the 75th anniversary of the NAA Awards celebration March 31, Alumni Medalist Raymond Farley (EB51), Service to Society recipient Lawrence C. Marshall (L85) and 19 Alumni Merit and Service Award winners joined these early recipients of the NAA Awards and became the newest generation of the University's most distinguished alumni. Led by Northwestern President Henry S. Bienen, NAA president Alan Wolfson (McC80) and NAA executive director Cathy Stembridge (GC00), nearly 400 members of the University community paid tribute to this year's winners at a black-tie gala at the Palmer House Hilton Hotel in Chicago. Farley received the Alumni Medal, the University's highest honor, for his outstanding lifetime of service -- as a decorated soldier, international business leader and alumni volunteer and donor. During World War II, as a 20-year-old private in the U.S. Army's 10th Mountain Division, he led his company to safety during a night attack in Italy's Apennine Mountains, earning a Bronze Star. He went on to earn his undergraduate business degree at Northwestern and begin his career at the household product company SC Johnson (formerly known as Johnson Wax). He rose to the position of president and CEO in 1988, becoming the second nonfamily member to lead the 120-year-old firm, and retired in 1990. 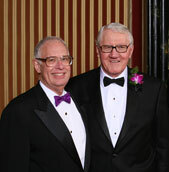 A life member of the University's Board of Trustees and Kellogg School of Management advisory council, Farley helped endow the school's S.C. Johnson & Son Chair in International Marketing in the late 1980s and helped raise money for the construction of the James L. Allen Center on the Evanston campus in the mid-1970s. Farley has also been a longtime supporter of University Athletics. He co-chaired the Future Is Now capital campaign to renovate Ryan Field and McGaw Hall, chaired the football stadium turf project in the mid-1990s and under Patrick G. Ryan (EB59), now chair of the Board of Trustees, chaired the Athletic Facilities Campaign major gifts committee that resulted in the construction of the Dellora A. and Lester J. Norris Aquatics Center and Henry Crown Sports Pavilion. He was also a member of the Ron Burton Center Committee that created the Ron Burton Academic Advising Center in Harold Anderson Hall. Marshall, now a professor at Stanford Law School and its associate dean for public service and clinical education, was honored for his work as co-founder and legal director of Northwestern's Center on Wrongful Convictions that led to the state of Illinois' moratorium on executions in 2000 and the 2003 commutation of 164 Illinois death row inmates' sentences. WCBS-TV news anchor Maurice DuBois (J87) presented the 2007 Merit Awards to Susan Schmidt Bies (G68, 72), former governor of the Federal Reserve Board; Mark D. Booth (KSM97), president of Takeda Pharmaceuticals North America; John J. Conroy Jr. (L79), chair of the law firm Baker & McKenzie; Linda Kinsel Foley (J77), president of the Newspaper Guild and vice president of the Communications Workers of America; Susan Levine Fuhrman (WCAS65, G66, School of Education and Social Policy recipient), president of the Teachers College of Columbia University (see "All the Presidents Men and Women"); Renetta Walker McCann (C78), CEO of Starcom MediaVest Group Worldwide; Marlena Miglin Egan (SCS91), chief operating officer of Marilyn Miglin L.P.; Harold Louis Paz (GFSM85, 86), dean of the College of Medicine and chief executive officer of the Milton S. Hershey Medical Center at Pennsylvania State University; Steven C. Preston (WCAS82), administrator of the U.S. Small Business Administration; Howard Reich (Mu77), author and Chicago Tribune arts critic; Perry Tuneberg (D82), a dentist with Perry Tuneberg & Associates; Thomas C. Tyrrell (McC67), retired executive vice president of governmental affairs for Sony Music Entertainment; and Adam Stein Weinberg (G91, 94), executive vice president of the U.S.-based nonprofit World Learning and provost of its School of International Training. Service Awards went to Jen Bender (C01), former president of the Northwestern University Entertainment Alliance East and director of the 2006 "A Toast to the Past, A Toast to the Future" NAA Night with Northwestern in New York performance; Edith Howard Bostic (SESP74), director of the Atlanta-area Alumni Admission Council and class of 1974 reunion co-chair; Christine Brennan (J80, GJ81), who volunteered as a guest host and speaker for the Medill School of Journalism, University Athletics and 2005 NAA Awards celebration; Carey T. Graeber (C75), former president of NUEA East, former NAA regional director and School of Communication internship instructor; Suzan Laural Rayner (FSM85, GFSM89), former Feinberg School of Medicine Alumni Association board president and Feinberg minority affairs advisory committee and scholarship committee member; and Christine Olson Robb (WCAS66), Northwestern University Women's Board president, Mary and Leigh Block Museum of Art board of advisers chair, class of 1966 reunion co-chair, former chair of the John Evans Club, former member of the Northwestern Board of Trustees and former Campaign Northwestern vice chair. To nominate outstanding alumni for the 2008 Alumni Medal, Merit, Service or Service to Society awards, visit www.alumni.northwestern.edu/awards.